BWB is an independent owner-managed multi-disciplinary consultancy operating nationally from 5 regional offices. 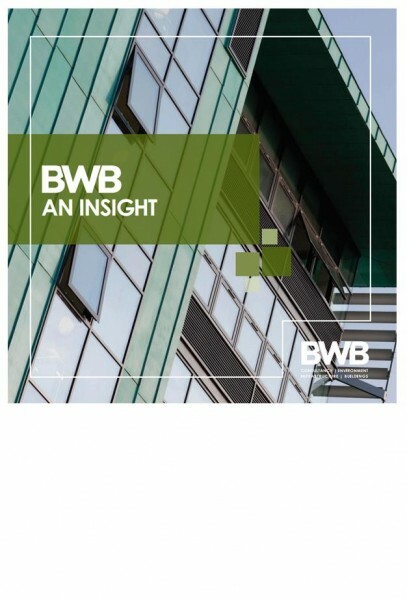 Over the past 20 years, BWB has established a reputation for delivering high quality, commercial consultancy services, spread across a variety of professional disciplines such as building, planning, infrastructure, environmental, site investigation, surveys, transportation, expert witness and Building Information Modelling. We’re consummate professionals. Work with us and you can expect the very best, including all the advantages of having one key point of contact throughout our involvement in your project. Forming strong, trusted and effective partnerships with our clients and fellow professionals is a key component of our service ethic. Our directors and senior decision makers are actively engaged in the delivery of our services, and as an owner-managed business we are passionate about the quality and reliability of the service we provide. We take real pride in our reputation for the provision of clear and reliable advice and value-engineered solutions, delivered to programme and within budget. In short, a company that provides first-rate professional services based on a fluid approach and solid delivery. Our professional approach, clear communication, talented people, teamwork and our passion for excellence ensures that our Clients come back time and time again. We are in fact considered by them to be valuable, trusted advisors.